Each year, I begin my course on Ecology and Design with quotes from astronauts who have seen Earth from space, and I remind my students of the first time humans were able to get this awe-inspiring view of Earth. After 40 years of Earth imagery, we take this perspective for granted, I’m afraid. The 40th anniversary of the Blue Marble image, shot by the crew of Apollo 17 in 1972, is celebrated in a short film by Planetary Collective. For the first time in my life I saw the horizon as a curved line. It was accentuated by a thin seam of dark blue light – our atmosphere. Obviously this was not the ocean of air I had been told it was so many times in my life. I was terrified by its fragile appearance. Before I flew I was already aware of how small and vulnerable our planet is; but only when I saw it from space, in all its ineffable beauty and fragility, did I realize that human kind’s most urgent task is to cherish and preserve it for future generations. A 1992 article titled Wicked Problems in Design Thinking by Richard Buchanan in Design Issues journal is worth a fresh look, and, in fact, it continues to be cited by many authors. 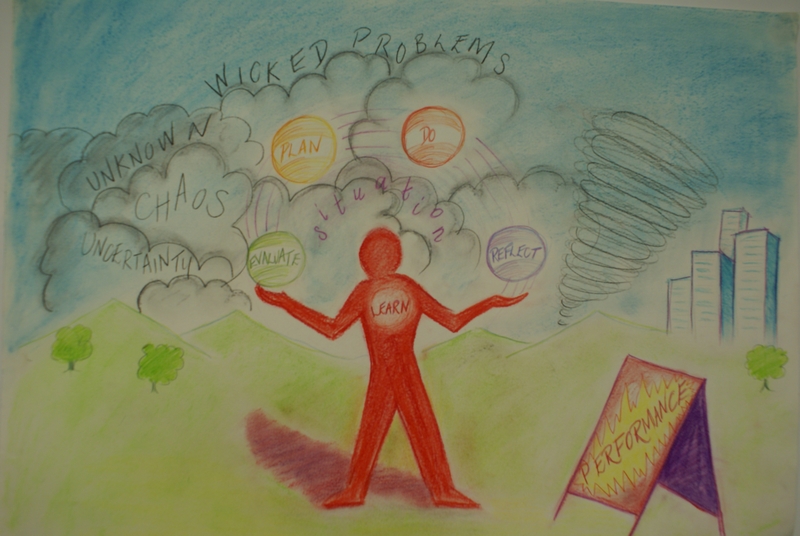 [A description and definition of wicked (and super wicked) problems can be found here.] I found the discussion of the communication gap between scientists and designers to be especially interesting. Members of the scientific community, however, must be puzzled by the types of problems addressed by professional designers and by the patterns of reasoning they employ. While scientists share in the new liberal art of design thinking, they are also masters of specialized subject matters and their related methods, as found in physics, chemistry, biology, mathematics, the social sciences, or one of the many subfields into which these sciences have been divided. This creates one of the central problems of communication between scientists and designers, because the problems addressed by designers seldom fall solely within the boundaries of any one of these subject matters (pg. 14). Buchanan then speculates that the heart of the problem is the indeterminate nature of the problems addressed by designers. In other words, design problems are wicked because they are indeterminate. Design problems are “indeterminate” and “wicked” because design has no special subject matter of its own apart from what a designer perceives it to be. The subject matter of design is potentially universal in scope, because design thinking may be applied to any area of human experience. But in the process of application, the designer must discover or invent a particular subject out of the problems and issues of specific circumstances. This sharply contrasts with the disciplines of science, which are concerned with understanding the principles, laws, rules, or structures that are necessarily embodied in existing subject matters. Such subject matters are undetermined or under-determined, requiring further investigation to make them more fully determinate. But they are not radically indeterminate in a way directly comparable to that of design (pg.16). design is fundamentally concerned with the particular, and there is no science of the particular. In actual practice, the designer begins with what should be called a quasi-subject matter, tenuously existing within the problems and issues of specific circumstances. Out of the specific possibilities of a concrete situation, the designer must conceive a design that will lead to this or that particular product. A quasi-subject matter is not an undetermined subject waiting to be made determinate. It is an indeterminate subject waiting to be made specific and concrete (pg. 17). Buchanan explains how designers deal with indeterminacy through his theory of “placements” – signs, things, and actions organized by unifying ideas or thoughts. This is where placements take on special significance as tools of design thinking. They allow the designer to position and reposition the problems and issues at hand. Placements are the tools by which a designer intuitively or deliberately shapes a design situation, identifying the views of all participants, the issues which concern them, and the invention that will serve as a working hypothesis for exploration and development. In this sense, the placements selected by a designer are the same as what determinate subject matters are for the scientist. They are the quasi-subject matter of design thinking, from which the designer fashions a working hypothesis suited to special circumstances. This helps to explain how design functions as an integrative discipline. By using placements, the designer establishes a principle of relevance for knowledge from the arts and sciences, determining how such knowledge may be useful to design thinking in a particular circumstance without immediately reducing design to one or another of these disciplines (pg. 17-18). I am particularly interested in essays like this one that explore the relationship between design and the sciences – natural, physical, and social. Landscape architecture academics often find themselves having to prove the value of design thinking in relation to the scientific disciplines that dominate university campuses. Explication of the unique role of design and its relationship to other disciplines aids this process. But, Buchanan’s work is just one perspective. Do any challenges to his stance come to mind? Or thoughts that expand on his work? Feel free to comment by following the link. It would seem that conceptual thinking is inseparable from design, but I find that many design students just cannot grasp the idea of abstraction. Can this be taught? Is the capacity for conceptual thought just part of a person’s DNA? In searching online for insights, I found these observations. To make their thinking useful, abstract thinkers need to be able to convert something abstract into something concrete, and vice versa. This ability is what I call conceptual thinking. A conceptual thinker starts in the concrete, then walks up the hierarchy of abstractions. At some level they make connections between the abstract representation of the concrete thought and another abstract representation. If need be, they can then walk that abstract thought back into another, very different concrete thought. The idea is that a local search (i.e. making connections) in the abstract space is easier than a local search in the concrete space. And so that person can either communicate more effectively, or solve the problem more effortlessly. The example given of moving from the concrete to the abstract is seeing the concrete problem as an example of a more generic class or category of problems. Pattern recognition leads to relationships between ideas and eventually back to the concrete.